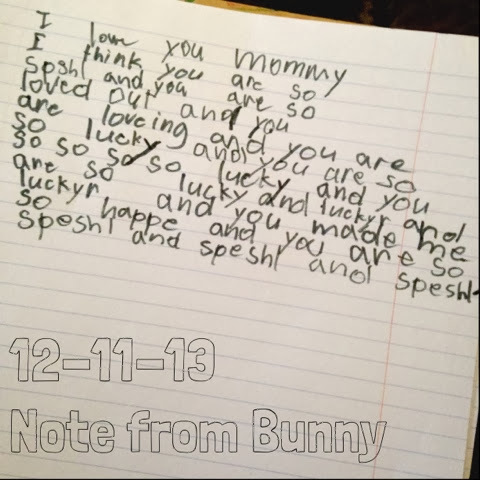 In an effort to redeem myself from yesterday's post, I give you this letter written by Bunny on her I-have-a-slight-cold-and-must-stay-home-from-school-death-bed. You'll notice it is addressed to Mommy. That is me. I'm not a monster I tells ya! Because we're still in first grade phonetic spelling, I will translate for you. Keep a tissue box close. I love you Mommy. I think you are so special, and you are so loved (out?) And you are loving and you are so lucky and you are so so so so so lucky and you are so lucky and lucky and lucky and you made me so happy and you are so special and special and special. You hear that, internet?! I am SPECIAL.